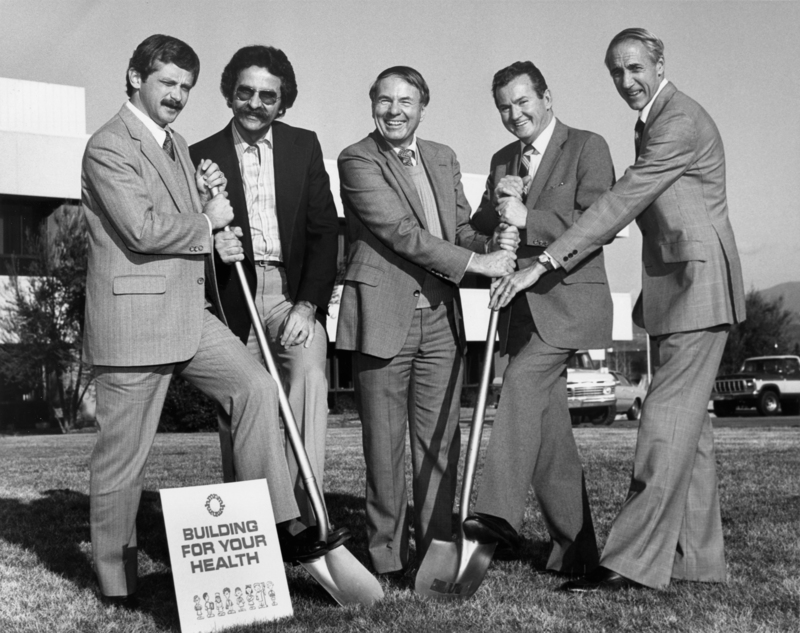 Groundbreaking for an expansion (we're still trying to figure out exactly what and when) at Henry Mayo Newhall Memorial Hospital in Valencia, probably early 1980s. The main hospital building (1975) is visible in the background. L.A. County Assessor records list a subsequent construction date of 1980; other sources give a completion date of 1983. From left: Hospital Chief Administrator Duffy Watson; Dr. David E. Mysko, physican and general practitioner on Lyons Avenue; Adrian Adams, Newhall Municipal Court judge and founding chairman of the hospital board; Jim McMahon, president of Santa Clarita National Bank at Lyons and Peachland Avenue; John Fuller, founding treasurer and later chairman of the hospital board. The story of Henry Mayo Newhall Memorial Hospital is a tribute to initiative, leadership and community support. Twenty years before the City of Santa Clarita was incorporated (in 1987), civic planners acknowledged the importance of quality health care and enfolded the necessary elements into their vision. Until the 1960s, Santa Clarita Valley's needs were met by several small hospitals. However, when the master planned community of Valencia was approved by Los Angeles County in 1965, its developer, the Newhall Land and Farming Company (Newhall Land) knew that larger, more sophisticated medical facilities would be necessary. Newhall Land donated 25 acres of land for a hospital in the center of town. Thomas Lowe, then chief executive officer of Newhall Land, formed an alliance with the Lutheran Hospital Society (LHS), an organization with half a century's experience developing and managing community not-for-profit hospitals. The two organizations recruited a citizens' committee to help raise the funds needed to construct and open the new hospital. Newhall Land executives and members of the Newhall family donated cash and stock for development funds. By 1970, the citizens' committee had become the hospital's Board of Trustees, under the leadership of Judge Adrian Adams. In December, they launched a fund drive to raise money to build the hospital, and in February 1971, the trustees hired the hospital's first employee, Bobbie Trueblood (Davis), director of community relations, to spread the word about the planned hospital and organize support groups. Ground was broken September 1972. While the hospital was under construction, LHS purchased Inter-Valley Community Hospital (renaming it Hillside Community Hospital) to serve as an interim facility. This strategy enabled the recruitment of medical staff and employees, stimulated additional community support, and afforded vital continuity until the new hospital could be opened. Construction was completed in 1975, and the hospital opened for business in August of that year with 100 beds, including an ICU and coronary units. As of 2012, Henry Mayo Newhall Memorial Hospital (popularly called Henry Mayo) is a 227-bed, not-for-profit community hospital and trauma center. It continues to be the only hospital in the Santa Clarita Valley and offers a wide range of patient services, including emergency, intensive care, maternity, surgery, nursing, wound care, stroke, behavioral health, and acute rehab, as well as cancer, cardiology, imaging, lab, digestive, respiratory services and physical and occupational therapies. HM8301: 19200 dpi jpeg from original 8x10 photograph by Vanguard Photography of Hollywood (3371 Cahuenga Blvd. West).